Forty years ago, the streets of the Soweto township in South Africa’s economic capital Johannesburg turned bloody. Thousands of mostly black students lined the streets, refusing to go to school until a controversial law ordering that lessons be taught in Afrikaans, a language deeply associated with the racist apartheid regime eventually abolished in 1994. The student protesters were met with deadly force by police and photos of the clashes became emblematic of the struggle of black South Africans for equal rights. As the country marks the anniversary of what is known as the Soweto Uprising—which has now been designated a national holiday, Youth Day—here are five things you should know about an event that left an indelible mark on South Africa’s history. In 1974, South Africa’s apartheid government—led at the time by Prime Minister B.J. Vorster—passed the Afrikaans Medium Decree, which stated that all black schools must use a 50-50 mixture of English and Afrikaans in lessons. Afrikaans was designated as the sole language for certain subjects, including mathematics and social studies. The decree was decried by black schools and teachers’ associations on the practical basis that many black children did not speak the language, making pedagogy much more difficult. On a more symbolic level, however, Afrikaans was seen as the “language of the oppressor,” as described by Desmond Tutu—it was the language of the apartheid government and was heavily associated with the system of white-minority rule. A series of smaller protests against the Afrikaans directive had already taken place ahead of June 16, when black students gathered to march from their schools in Soweto to the nearby Orlando Stadium. Estimates of the number of students involved that day range between 10,000 and 20,000, and the demonstrations were backed by anti-apartheid groups such as the grassroots activist Black Consciousness Movement. The students were confronted by armed police blocking their route and the protests soon descended into violence, with police firing live rounds at the gathered children and teenagers. Though many children perished in the violence of the Soweto uprising, the image of 18-year-old Mbuyisa Makhubo carrying the limp and blood-stained body of Hector Pieterson, 12, served as the touchstone for international outrage at the crackdown. Pieterson is believed to have been one of the first children killed in the violence and a memorial and museum in his name was established in the Orlando West suburb of Soweto in 2002. The memorial commemorates the victims of the Soweto uprising and South African politicians laid wreaths there on Thursday to mark the anniversary. The image was taken by local photographer Sam Nzima, who was punished with 19 months of house arrest following the publication of the image. According to Nzima, U.S. presidential candidate Hillary Clinton once tried to buy the camera he used to take the photo, but the offer was rebuffed by the former wife of Nelson Mandela, Winnie Madikizela-Mandela. “Winnie Mandela said no. She said, ‘This camera belongs to South Africa, it is the property of our country. We cannot allow it to go to America.’ And that was the end of the story,” said Nzima. While it would be another 14 years before Nelson Mandela was released from prison—and another four years after that before the apartheid regime was finally overthrown—the Soweto uprising was an important moment in the struggle of black South Africans for equal rights. 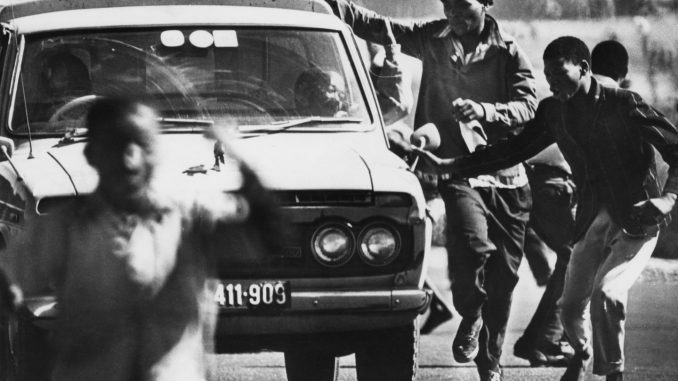 The protests, which rolled on for months after June 16, garnered international attention—the uprising was immortalized in numerous books and films, including the Richard Attenborough-directed Cry Freedom—and ultimately achieved its goal, with the South African government reversing the Afrikaans decree in July 1976.